Definitions of some technical terms commonly used for describing a writing system – specific Visigothic script terms will be progressively added. Approach stroke: That which records the initial movement of the pen into an essential stroke in the construction of a letter form. Ascender: That essential element of the letters b, d, f, h, I, k, l, tall-s and y which extends above the headline or minim height. Aspect: The general appearance of a script. Auxiliary elements: Those strokes which record all or part of those movements of the pen that enabled a scribe to manoeuvre it into the appropriate positions to trace strokes forming the essential or subsidiary element of a letter, or to make the transition from one letter to another. Bar or crossbar: The horizontal stroke between the obliques of A and the uprights of H.
Baseline: The writing line, the ruled line on which the scribe enters text and below which the descender of a letter extends. Biting: Consecutive letters whose bows overlap with a shared stroke, such as æ. Originally adopted as a space-saving device during the 12th c., but exploited as a feature of style in formal handwriting in the following centuries. Bow or lobe: The closed curve of the letters b, d, p, and q. Broken stroke: The stroke of a letter that is made when the scribe changes the direction of the pen without lifting it from the writing surface. Clubbed ascender: An ascender that is thickened at the top, giving it a blunt or ‘clubbed’ appearance. Constant pen-angle (defined in relation to a horizontal level above the line of writing): Determined by the angles at which a scribe cut the nib and held the pen. The angle is recorded in the direction of the broadest strokes, and the opposite direction (at a right angle) of the hairline strokes formed with the edge of the nib. Different pen-angles produce different profiles of letter shapes. Cross-stroke or hasta: The stroke at the centre of the letters e and f.
Cursive handwriting: A script in which letters are formed without lifting the pen between strokes. A cursive script can, therefore, be written more rapidly, and is more informal, than a bookhand. Descender: That element of the letters f, g, j, p, q, r, long-s, x and z, which extends below the base of the minims or baseline. Display script: A decorative script often used in early medieval manuscripts, along with a decorated initial, to emphasise and embellish the opening of a text. The display script may use letter forms of a higher grade than the regular text script. Ductus: The act of tracing strokes on the writing surface. A basic ductus determined the order and direction of the traces in the configurations required for the basic shapes of the letters in a particular script. A personal ductus determined the ways in which a scribe executed the traces of a basic ductus. E-caudata: An e written with a hook below it, where classical Latin would use ae. Finishing stroke: The final stroke in the configuration of a letter form, for example the ‘tongue’ of e.
Hand: The script or style of writing of an individual scribe. Headline: The line that serves as the upper boundary for letters of minim height, and above which ascenders extend. Headstroke: The top horizontal stroke of letters such as f.
Juncture: The point at which one stroke was joined to another when constructing a letter form. Letter form: The configuration of traces required to construct a particular letter shape. Letter shape: That which embodies the characteristics, or essential elements, which enable a reader to distinguish one letter from another in the alphabet of a particular script. Components of letter shapes are frequently described in metaphorical terms (for example, ‘arches’ of m and n; ‘headstrokes’ of f, and long-s; ‘lobes’ of b, d, and q; ‘tail’ of g; ‘tongue’ of e). Ligature *: Parkes distinguishes two categories: (i) when two adjacent letter forms have been disarticulated and their elements reassembled to create a single form: for example, e and t to produce the form &; (ii) when two adjacent letters have been linked, and one has been modified in the process, whilst retaining its recognisable basic shape, for example in the ligatures ct and st. However, Spanish palaeographers differentiate (i) ligature: a link between two letters in which neither changes its shape – as with the ligature s+t, and (ii) nexus: a conjunction of two letters in which a common stroke is shared by both and without which their basic shape is not completed – as the nexus between o+r or inverted beta t and e.
Limb: The curved stroke attached to the upright of the letter h.
Low i: A special form of the letter i in Visigothic script which resembles a j and was used to differentiate the two sounds of the syllable ti. Low-set s: A form of s in which the basic shape is that of a tall s but one which descends below the baseline. Majuscule: A script in which all letters are the same height. Also called a bilinear script because all the letters fit between the headline and the baseline. Minim: The short vertical stroke used to make the letters i, m, n, and u in minuscule scripts. Minuscule: A script in which some of the letters have ascenders and descenders so that not all letters are of the same height. Module: The distance between the base of the minim strokes on one line and the base of the minim strokes on the next line. Some scribes wrote on a ruled line, but many scribes wrote between the ruled lines, using them as a principal guide for the two levels of the handwriting. Nib-width: Scribes seem to have preferred a narrow nib for small or rapid handwriting, and a broader nib for a set hand. The width of the cut nib was apparently used as a measure when deciding on an appropriate height for the letters since the heights of minim strokes or ascenders frequently correspond to a specific number of nib-widths. Open e: A special form of the letter e in Visigothic script that remains open. It is the allograph of e commonly used in ligatures. Palaeography: The science of the study of handwriting. The aims of palaeography are to read scripts accurately and to date and localise them. Resources of style: The principal elements of style were strokes produced by formalised prototype cursive movements, often reduced in size, and which could be incorporated into the configurations of traces in a set hand to embellish details in the components of a letter shape. Scribes also borrowed features of style from other contemporary scripts, or, in archaising hands, from earlier scripts. Round r or 2-shaped r: A form of the letter r resembling an Arabic numeral 2, originally used only when r followed o. Round s: The form of the letter s that resembles the modern letter. Script: An alphabet regarded by many contemporary scribes as a suitable model, or, more frequently, a present, which each scribe had in his mind’s eye when producing his own rendering of it on the page. Serif or finial: A short stroke at the top of an ascender, and at the base of a minim stroke, which helps to keep the eyes of a reader from slipping accidentally from one line to the next. Stem: The upright portion of a letter that supports another part – for example, the left stroke of h.
Stroke: A record on the writing surface created by a single trace. Subsidiary elements: Features above or below the cue-height which have a supplementary function to enable a reader to read more quickly. For example, ascenders were supplied with serifs, or with strokes to produce a wedge-shape, a fork or hook, or a loop, which emphasise the top boundary of a line of writing, and carry the eye of the reader downwards towards the level of the cue-height. Elaborate treatment of final minims assists a reader to distinguish between m and n.
Tall i: A special form of the letter i in Visigothic script which resembles a majuscule I without serifs, thus, just a vertical stroke. It was used at the beginning of a word when the next letter did not have an ascender, and in the middle as a semi-consonant. Tall s: The form of s used in Caroline minuscule and other scripts. The letter resembles an f without the cross-stroke. Trace: The movement of the pen which produced a stroke on the writing surface. Transitional strokes: Curved or diagonal finishing strokes which touch or connect to the following letter without forming a ligature, all of which contribute to the consistent spacing between letters. Uncial d or rounded d: A form of the letter d in which the ascender is not straight and vertical but curves back towards the left. 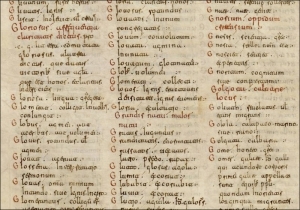 Uncial g: A form of the letter g in Visigothic script in which the letter does not form a bow but instead remains open on its right side. Upright a: A special form of the letter a in Visigothic script in which the first stroke is placed above the baseline. Uprights: Vertical letter strokes, such as the left and right stems of h.
Upstroke: An upward stroke of the pen. M. B. Parkes, Their Hands Before Our Eyes. A Closer Look at Scribes, Aldershot-Burlington 2008. R. Clemens, T. Graham, Introduction to Manuscript Studies, Ithaca 2007.